MANILA, Philippines – Nobody expected that PBA Governor’s Cup Finals Game 1 will be a lopsided victory in favor of the San Miguel Beermen (SMB) as they demolished the Alaska Aces 108-78 on Friday, July 10, 2015 at the Mall Of Asia Arena in Pasay City. It has been 6 months since the Aces and the Beermen fought toe-to-toe for the All Filipino Cup crown where San Miguel won the title 4-2. Tonight, they faced again with a common mindset of copping the PBA Governor’s Cup championship. ROS vs SMB Semis Game 4 Best Player of the Game winner Junmar Fajardo officially opened the Governor’s Cup Finals with a perimeter jumper over the outstretched hands of Sonny Thoss. Alex Cabagnot who showed superb basketball in the semis got Coach Leo Austria’s trust to put him back on the starting unit once again. The lefty guard made a back-to-back basket. Coach Austria shuffled his starter in this series by leaning on Chris Lutz on the 3 spot instead of his usual wingman-starter Marcio Lassiter. Lutz started hot with 2 three-pointers and a drive to the basket and one for a total of 9 points under 4 minutes of the opening period. SMB’s lead went as high as 19 points in the latter part of the 1st period due to Beemen’s hot outside shooting. But it was Don Don Hontiveros who exerted more effort on the Alaska side to lower the margin. The Beermen ended the 1st quarter in a high note, 35-22. Both teams were not shooting well in the starting minutes of the second period not until Fajardo banked a shot from the right side and Chris Banchero sank a baseline jumper. Alaska Bruiser Calvin Abueva put good defensive stops on Arizona Reid in the first-half and limited the latter to just 10 points without any 3-point shot. Aces import Romeo Travis on the other hand, was ice-cold with only 2 points under his name. JV Casio recorded his first points with a bang from downtown and managed to cut the lead to just a single-digit 37-46. Arwind Santos knew that the Aces are capable of doing great comebacks so he made sure that their counterparts would not carry the momentum heading to the second-half of the game with two triples. The Beermen maintained their double-digit lead, 54-41 after 24 minutes of good basketball. Unable to make clear shots, Romeo Travis played more of a passer than a scorer this time and entrusted the scoring chores to his local teammates while his fellow-import AZ Reid was still missing from the rainbow country. Travis finally made his second field goal, first in the second-half at 7:40 mark of the 3rd followed by a trick shot plus a foul. Every time that Alaska closed the gap, San Miguel pushed the pedals and managed to bring back their two-figures lead. For a very rare occasion, AZ Reid shot blank behind the arc but sustained his scoring onslaught inside. The man in dreadlocks made couple of a dozen points with 9 more minutes remaining on the game clock. Reid finished the game matching his jersey number with 32 markers. 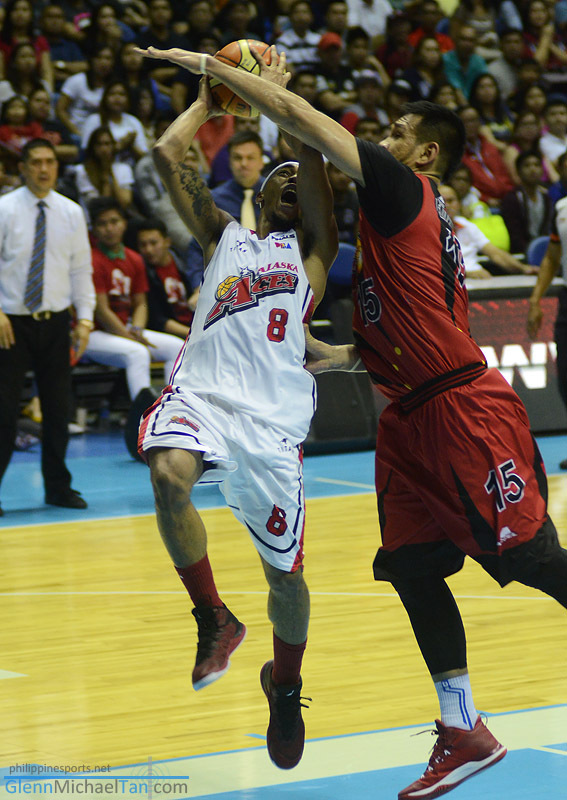 Reid was favored by many PBA fans to win the Bobby Parks Sr. Award or Best Import Award of this conference over his finals rival Romeo Travis. Awarding will be on Game number 3, Wednesday, July 15, 2015. Calvin Abueva sprained his wrist midway of the final quarter after he tapped the board hard for trying to block Junmar Fajardo’s shot. San Miguel totally broke away and posted a 20-point humongous margin under 5 minutes of the final quarter with all of its starters had scored 12 points at least led by AZ Reid. Coach Alex Compton waived the white flag at the 2-minute warning by pulling out his key players and replacing them with his second unit. The Aces have couple of days to adjust their game play in order to even the series. Game number 2 is on Sunday, July 12, 2015 at the Smart Araneta Coliseum in Cubao, Quezon City.